Kimberly Forness Wilson is a multi-talented artist, singer, and inventor from Maui, Hawaii and Grand Forks, North Dakota. In addition to having an accomplished art career she presents a variety of creativity workshops to help people in recovery, individuals with mental challenges, children with special needs, and at-risk youth. For five years Wilson has been presenting “Mental Health Art Tribe”, a workshop designed for artists dealing with mental health issues. She takes pride in the fact that her students have received several awards including the Mayor’s Choice Award and her group has received the keys to the city of Grand Forks, North Dakota. 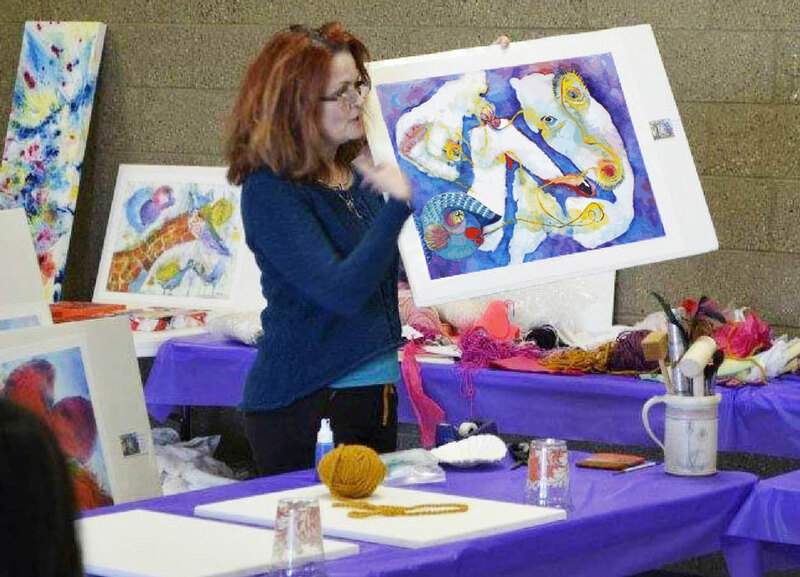 Kimberly Forness Wilson holds up one of her imaginative watercolor paintings in one of her workshops. Prior to becoming a full-time artist Wilson enjoyed many years in the theater and choir, until 2003 when her life as a singer took a sudden turn. 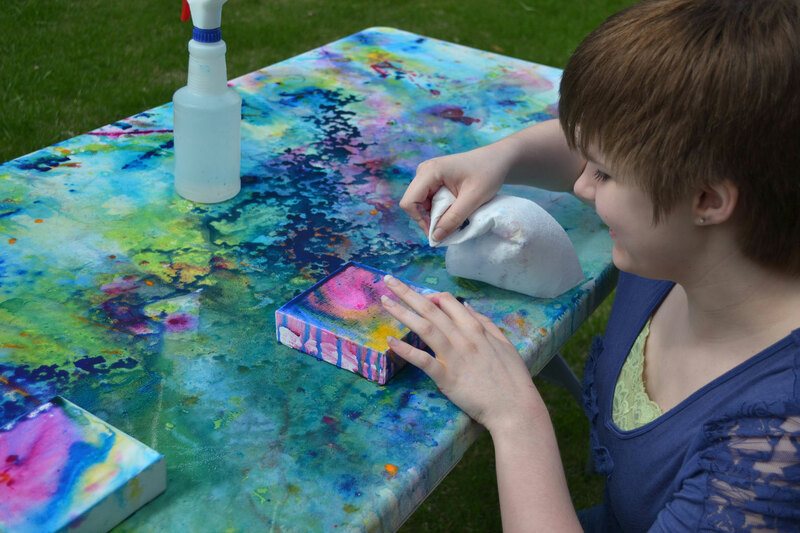 A participant in one of Wilson’s workshops enjoys the creative process of spreading watercolors onto canvas. 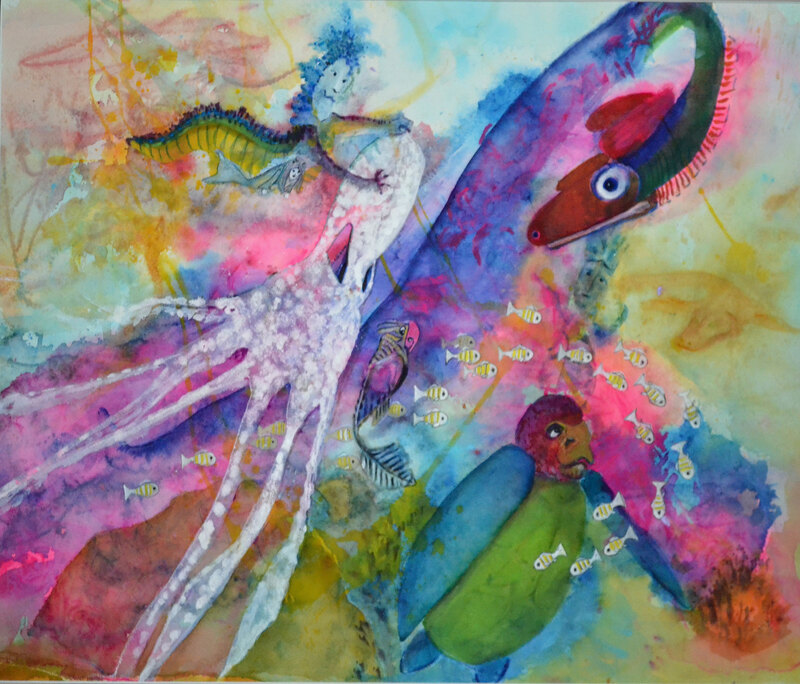 Kimberly Forness Wilson, Miss Tako’s Extraordinary Day, watercolor and mixed media, 20″ x 24″. Her unique artistic expression is a balance between sophisticated lyricism and childlike spontaneity. With unfiltered imagination she creates fanciful compositions that are adorned with animal and sea creatures that seem to emerge from folklore and fairy tales. Inspiration for Wilson’s art originates from nature, music and dreams in addition to her cultural influences that include Scandinavian, Native American, Hawaiian and Asian. Her whimsical paintings offer a respite and escape from the confines of reality, pain and suffering. 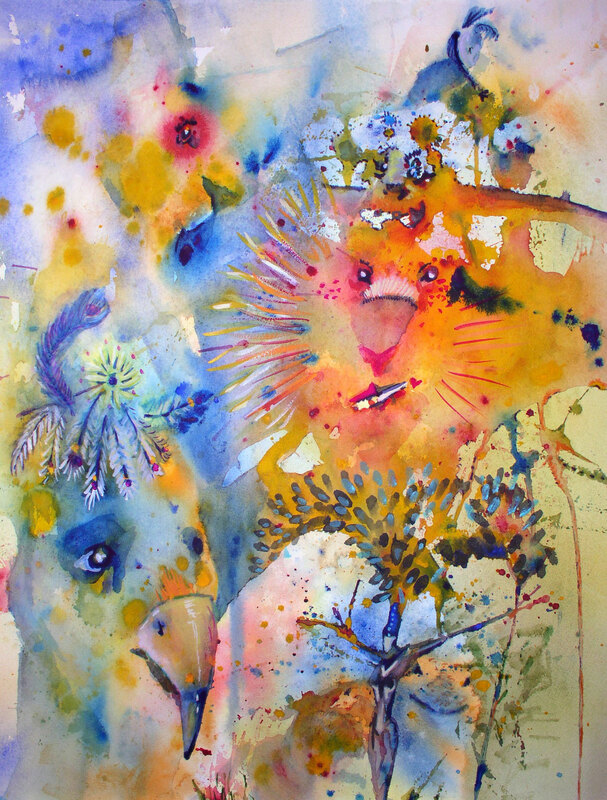 Kimberly Forness Wilson, Animagination, watercolor and gouache on paper, 24″ x 20″. Wilson’s art is in many private and public collections throughout the world — from Saudi Arabia to the Hawaiian Islands, including Rochester’s Ronald McDonald House. She is the recipient of numerous awards including the NoVac’s “Artist of the Year” Award. She also received the Dawn Bonner Professional Award from Consumer Family Network for her healing art work with adults in mental health recovery. Her artwork has been exhibited in many galleries primarily in Minnesota and North Dakota. It has been featured in many publications and was on the cover of Woman’s Day Eating Light magazine. Wilson is also a Featured Artist in the Manhattan Arts International curated Art Program, based in New York, NY. One of Wilson’s most popular workshops is titled “Healthy Living Through Art”, designed to assist participants — from children to adults — in exploring their health and wellness through weekly art projects. She also presents “Joy of Art” for individuals and groups several times each year and co-creates healing works of art with other artists. Wilson reminds us that sometimes a devastating loss or illness might also serve as a monumental turning point in one’s life. Fueled by compassion she is on a mission to share her creativity and make a difference in the lives of many individuals who are struggling with physical and mental challenges. Renée Phillips is an arts advocate, author, and curator who lives in New York, NY. She is founder/director of Manhattan Arts International, www.ManhattanArts.com, which rewards artistic excellence through curated art programs. She has curated more than 60 art exhibitions in New York and her annual “ The Healing Power of Art” online exhibitions have gained worldwide recognition. She is founder and executive editor of The Healing Power of ART & ARTISTS website at www.healing-power-of-art.org, an online magazine that fosters appreciation for art and art initiatives as catalysts for healing individuals and society. She has served on the advisory boards of several non-profit arts organizations including the UNCF "The Art of Giving Back". She is a member of the International Association of Art Critics, USA. The author of several books she is most recognized for six editions of "The Complete Guide to New York Art Galleries" and three editions of “Success NOW! For Artists: A Motivational Guide for the Artrepreneur”. Her articles related to art and business and art and inspiration appear on www.Renee-Phillips.com. She is an art business columnist for Professional Artist magazine. Known as “The Artrepreneur Coach” Renée provides career direction for artists world-wide and has presented many seminars including those at New York University, Art Institute of Chicago, Museum of the Moving Image, and New York Foundation for the Arts. Renée studied art at the Art Students League and was a fulltime professional artist before becoming an active arts writer and Editor-in-Chief of Manhattan Arts International magazine in 1983.